In my mind, blueberry muffins are a delicious, tender, white flour affair–sort of like cake! 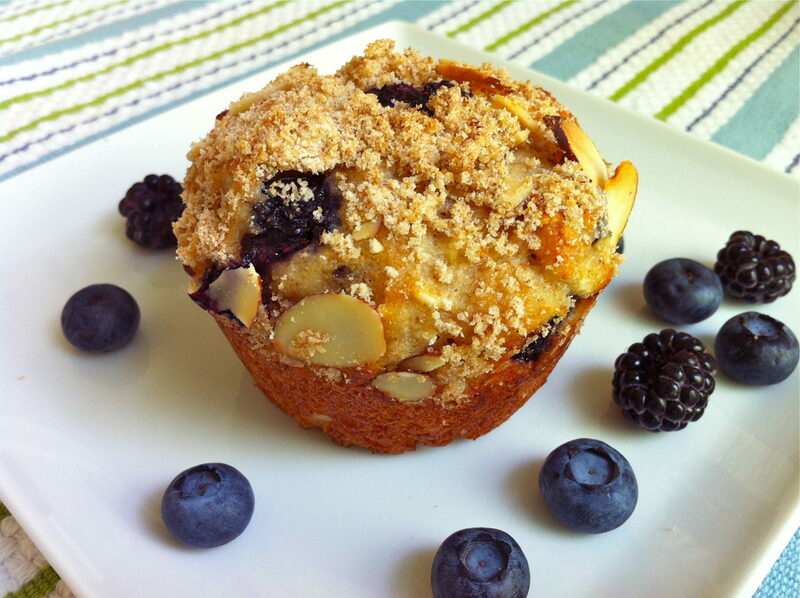 As often as I create healthy muffin recipes, until now I had not messed with the classic blueberry muffin. But loving blueberries as I do, and because I like muffins to be a healthy breakfast or snack option, it had to be done. It just so happens that my younger son was having a lemonade stand with some friends the first day I experimented with these. They wanted to sell the muffins along with the lemonade, so I gave them a plateful. The muffins sold quickly (the boys picked the price of a quarter) and the feedback, the boys said, was good. I wasn’t entirely happy though. They weren’t up to my standards and I didn’t feel good about publishing the recipe. Back to the drawing board! After making some adjustments, I found a version that I really think is terrific. This is a hearty, not-too-sweet spin on the classic. The muffins are loaded with protein and whole grains and take rather well to a smear of mascarpone cheese if you’re so inclined. But most importantly, they are delicious as is. Another element I think is important is for the muffins to still be moist and delicious when they are a couple of days old. These are. You can’t eat them all hot out of the oven, after all! For this batch, I used a mix of blueberries and black raspberries. Feel free to use any combination of berries or go with the traditional all-blueberry muffin. I wish I could get all those lemonade stand buyers back for a taste of the winning recipe! **For a new peach-blueberry version, click HERE. Recipes for baked goods often call for the cold ingredients to come to room temperature before mixing. This is especially helpful when using melted butter, coconut oil, or honey which tend to re-harden upon contact with cold ingredients. If this happens, I very gently and slowly heat the batter in the microwave until I can incorporate the ingredients fully–but not cook them. Combine flours, oats, sugar, baking powder, baking soda and salt in a large bowl. Make a well in center of the mixture and set aside. Combine the yogurt, milk, oil, vanilla, egg, and banana in another large bowl. Gently fold in the berries, stirring just enough to incorporate. Add the yogurt and fruit mixture to the flour mixture and stir just until moistened. Using a large ice cream scoop, fill about 20 greased muffin cups. Sprinkle with one of the desired toppings if you wish, and then bake for 15-17 minutes or until the muffins pass the toothpick test. Be careful not to over-bake. Cool in pans for 10 minutes, and then remove to a wire rack. ohhhh these look so yummy! I have small container of blueberries and large one of blackberries, think i must make these tonight! I do have a question, and pardon my ignorance but.. isn’t coconut oil very high in saturated fat? I notice it in many of your recipes for baked goods. I need more schooling on benefits of using it as opposed to other types of cooking oil. Good question about the coconut oil. It has the same total fat as other oils but is considered to have more of the “heart healthy” fats. The extra virgin coconut oil adds a very subtle flavor so generally will go unnoticed by someone who does not care for coconut. I love the smell, too. That said, it is fine to substitute canola oil or melted butter. I do use them all but try to mention this as another good option. I hope that is somewhat helpful. If you make these muffins, I would love to know what you think! Thanks so much for the comments! I might even save you two, Bam! Thanks for the thoughtful comment! Thanks Ann! I bought some coconut oil at Kroger, Spectrum organic brand. The one I got is more solid in the jar so I will warm it gently to melt. I am using blueberries and blackberries. I am making these today so will let you know how they turn out! The muffins are good! I used paper cupcake liners but forgot to spray them and the muffins stuck to paper.. ah well. I’ll remember next time! Instead of the struesel topping i used some vanilla almond coarse sugar. Really good! The vanilla almond sugar sounds delightful! I often find that muffins stick to the paper liners so I have gotten into the habit of greasing the muffin tin well and skipping the liners. It’s a little easier to clean the tin with the liners, but not too bad without. Thank you for the feedback, Mary Lou! I love this flavor combination! Delish!